Great Basin Riparian Ecosystems, edited by Jeanne C. Chambers and Jerry R. Miller, presents the approach used by the researchers to study and understand riparian areas in the Great Basin region. It summarizes the current state of knowledge about those areas and provides insights into the use of the information generated by the project for the restor-ation and management of riparian ecosystems. Because semi-arid ecosystems like the Great Basin are highly sensitive to climate change, the study considered how key processes are affected by past and present climate. 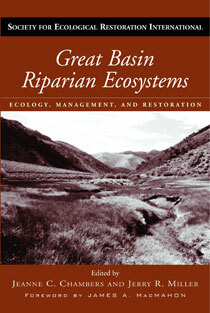 Great Basin Riparian Ecosystems also examines the processes over a continuum of temporal and spatial scales. Great Basin Riparian Ecosystems addresses restoration over a variety of scales and integrates work from multiple disciplines, including riparian ecology, paleoecology, geomorphology, and hydrology. While the focus is on the Great Basin, the general approach is widely applicable, as it describes a promising new strategy for developing restoration and management plans, one based on sound principles derived from attention to natural systems.